After ruling over Hastinapur for many years, Yudhisthira wanted to leave the kingdom. Parikshit, Abhimanyu's son, was crowned the new king and the Pandavas and Draupadi set out for the Himalayas. They dressed like hermits and set out to visit many holy places across the country. Finally, they reached the foothills of the Himalayas and started climbing the mountains. Somewhere along the way, a dog started following them. 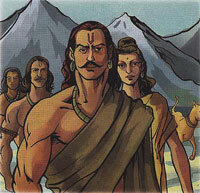 The Pandavas crossed many mountains and reached Himadri, the highest range of the mountains. The mountains were very steep and were covered with snow. The Pandavas started the difficult climb. Since it was difficult to walk on snow. Draupadi and all the Pandavas, except Yudhisthira, found it very difficult to continue on the journey. Draupadi was the first to fall to the ground and die on the way. She was followed by Sahadeva, Nakula, Arjuna, and finally Bhima. Only Yudhisthira and the dog adamantly continued marching ahead.